1 Top-of-the-line parallel electronics system provides exceptionally smooth and quiet operation. Synchronized high-low motors ensure the bed deck remains level even after frequent motion and long-term use. Durable construction with a 500-lb. weight capacity and unique grid/rib deck that prevents the structure from sagging. Patent-pending folding foot lock swings away when not in use to reduce tripping. 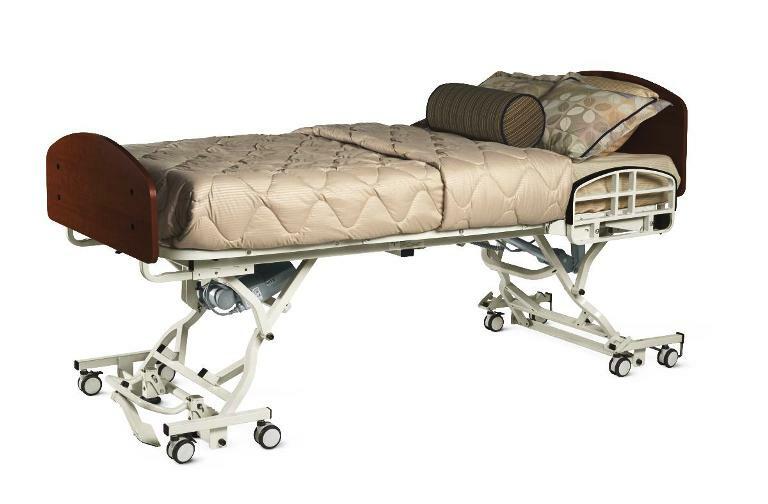 The bed meets the FDA's guidelines to help reduce the risk of entrapment. Multiple positioning options are made possible by the bed's motors,which control the bed's height, knee hinge and reclining head deck. The bed offers a full range of heights from 29.88" to 7.75". No horizontal movement when raising and lowering saves your walls from being damaged. Shown with optional Soft-Touch Assist Rails and custom head and footboards. *Note - Price includes just the bed only. Package price includes bed, mattress and rails. Please choose drop down boxes to cater your order.